A loud outburst reverberated through the hallway beyond the Music Room. Haydn was on his feet in an instant. God in Heaven! Whatever was the matter now? Could Barto get along with no one? I’m so excited to be chatting with Nupur Tustin about her debut novel, the first in a series of cozy historical mysteries. 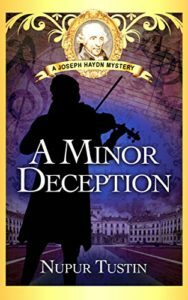 A Minor Deception features none other than composer Joseph Haydn as her amateur sleuth. I had never really thought about the subgenre of biographical mysteries, and the idea of being part of the conversation surrounding real, historical people until our conversation. Nupur reminded me of Susan Wittig Albert’s Beatrix Potter series, Stephanie Barron’s Jane Austen mysteries, and Bruce Alexander’s Sir John Fielding mystery series. She wanted to expand the conversation out of England, and into both the rest of Europe and the field of music. Haydn was the perfect choice. Nupur’s light touch with history has also been compared to Emily Brightwell’s wonderful Mrs. Jeffries Victorian mystery series. In a review, Emily calls A Minor Deception “elegantly written and plotted,” and Nupur returns the favor, citing Emily as a big influence and comparing her to Agatha Christie. On a related note, I had the pleasure of interviewing Emily here if you’d like to listen to our chat. Finally, Nupur writes a column called Agent Insight to help other writers on their road to publication. Writers out there, she also gives a shout out to the online Guppies chapter of Sisters in Crime. Writer or reader, you can keep up with Nupur on her website, Goodreads, and Facebook page, and subscribe to her newsletter — which earns you a free Haydn short story! — right here. As always, if you’d rather read than listen, here is the transcript. Enjoy! Laura Brennan: Journalist and composer Nupur Tustin combines her love of music and her way with words to create the Joseph Haydn Mystery Series. 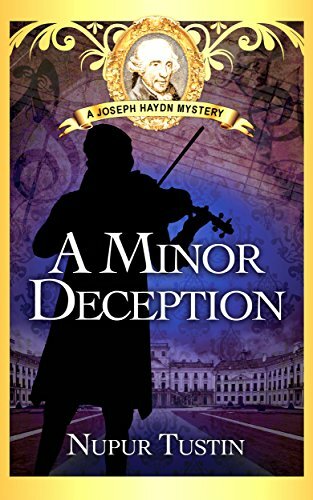 Her first novel, A Minor Deception, a blend of historical and cozy, finds Kapellmeister Joseph Haydn on the trail of a thieving violinist, as mystery, politics and danger swirl around him. Nupur, thank you for joining me. Nupur Tustin: Thank you, Laura. Thank you for having me. LB: Joseph Haydn doesn’t immediately spring to mind as a likely amateur detective. How did you first discover him? NT: Yes, I’ve heard that from a lot of people. You know, why Joseph Haydn? I suppose it was because I was reading biographical mysteries at the time. I’d just become a mother. It hadn’t been a difficult pregnancy as such, but I’d had four miscarriages before that so I was told to take it easy. And so that just meant that I couldn’t do very much, I was restricted to the bedroom, I couldn’t play my piano, and I was reading Susan Wittig Albert’s Beatrix Potter novels. And I remember reading the author’s note, and she talks about the considerable research that she’s done on the series, having read about Beatrix Potter for about 10 years, and I thought, well, I could do that. I had just come out of the PhD program and research is in my blood. And I thought, this sounds like fun. I can do that. It’s like writing a research paper, but you’re writing fiction and you’re kind of adding to the conversation. The conversation being biographical mystery series — Stephanie Barron’s Jane Austen series for instance, Bruce Alexander’s Sir John Fielding mysteries. That’s the conversation, biographical mysteries. So instead of setting it in England, why not set it in Europe, I said to myself. And I decided to do a composer instead of a writer, and Haydn appealed to me as I did the research. LB: What was it that appeal to you? His personality, his music? NT: A bit of both. His personality, really. Joseph Haydn came to be known as Papa Haydn by his musicians and by other people who came to know him — Mozart, for instance — because he was a very helpful person. He was a Kapellmeister, director of music. The Kapellmeister is expected to compose a lot of music and is responsible for the music programs at court, but the Kapellmeister also has to hire musicians, be in charge of them, ensure that there was no fighting and that they all work together as a team. And he had to ensure that he didn’t go bothering the Prince with minor problems. LB: Not to mention making sure his musicians didn’t kill each other. NT: Yes! Yes, and that came through my research. It’s hard to sort of imagine it might’ve been like that, and it’s hard to imagine the kind of problems that they had. That some musicians, for instance, couldn’t read music and played by ear. But you read about these problems over and over again in Mozart’s letters especially, his father’s letters to a great extent. You know, some of the problems that you have as a Kapellmeister, when you’re in charge of a group of musicians, you have to get them to work together, you have to get them to practice. You have to get them to create to the best of their ability. And it’s not just a question of playing a series of notes in the time and the rhythm in which they’re written, there’s more to it than just that. And to be able to get your musicians to do exactly what you want them to do requires really excellent communication skills. And Haydn was a great communicator. That’s the one thing that comes out over and over again. A very helpful person, a great communicator, and someone who could act as a good mediator. LB: How did you come up with the story? NT: Once I decided on Haydn — and I knew I was going to write a mystery because that’s what I like reading. And I liked the idea of an historical mystery because it seemed like a good way of getting people interested in history. And of course in this case, I wanted people to be interested in music history. So I was thinking about the kind of problem Haydn would be involved in. He’s an amateur sleuth, he’s not a detective, so what kind of problem would he be involved in? And a missing violinist, you know, he was a responsible Kapellmeister, so this was one of his duties. A violinist who went away, up and left, would have been a problem. Barto has a contract and he certainly can’t just leave unless he’s been dismissed. The fact that he takes away a valuable violin and then steals Haydn’s music, that was a problem too. But then of course I knew it had to be a little more intricate than that. I knew enough, even before I’d done the research, I knew enough about Austro-Hungarian relationships to know that there might be something there that I could use. And then, as I did the research, it all just began to fit in. LB: I knew nothing about Austro-Hungarian relationships when I picked up this book. NT: So, I mean, I’m from India. I grew up in India. And India used to be a colony. Colonial politics everywhere is the same. There’s the economics, the fact that the oppressed country is oppressed in so many ways. It’s not just about your identity, it’s about the economics of it all. Import duties, for instance, on Hungarian goods, which was unfair. Hungary was supposed to be a part of the Empire, so why impose import duties on Hungarian goods that had to pass through Austria? You’re treating it like a separate country but it’s not a separate country. And the same sort of thing happened in India. So that part of it I really understood. Also the fact that — and this happened in the United States, if you go back and look at history; in India as well — there are some people who benefit from the status quo. Some people who are perfectly happy with the way things are. And it’s actually a good way to run a colony, to keep some people happy. Keep some people in power, they’re happy, and you’re giving the money, you’re giving them power and status, and ensuring that they keep things running. They have a vested interest in things being as they are, and things remaining the same. So the Esterhazys and magnates like them were very supportive of the Habsburg Empire and they had a lot to gain. But there were other people who were quite dissatisfied with the state of things. Not so much in Maria Theresa’s time. In her time there was relative peace. LB: The Empress Maria Theresa seems very beloved. NT: Yes. She was. She’s a remarkable person. We’ll see a little bit more of her in the next novel. She’s just a remarkable woman. She knew it would be difficult for people to accept a female, accept an Empress, to accept a woman in power. So she portrayed herself — and this was easy for her to do, she had 16 children, at the beginning of her reign she was always getting pregnant or was on the verge of having a baby, so this was kind of easy — to portray herself as a mother. And that’s how she portrayed herself. You can denigrate women all you like, you might think they shouldn’t be in charge, but mothers are to be respected. That’s always been true. And she was a beautiful person, very charming, very tactful, good communicator. And so she was able to get the Hungarians on her side. LB: You also provide a very handy guide to the historical figures in the novel. NT: I thought that would be helpful. The idea actually came from my agent. Sometimes readers think that when you have a cast of characters, there’s going to be too many and they’ll get confused. Then the more I thought about it, the more I thought it would be an interesting idea because there are number of people who are there, the Estates Director, for instance — you wouldn’t know that he’s based on a real person, that there was such a person. He’s not a made up character. And I thought it would be interesting to do. And it was just another way of providing little bit of history. LB: How difficult was it to write about a real person as your central character? NT: Haydn wasn’t difficult because Haydn’s character was just so wonderful. He’s very helpful, which makes him a good detective because he’s a responsible person. He’s helpful, he’s the sort of person that you could go up to with your problem and he would try to help. This is someone you could confide in, someone who would be discreet and he is responsible. There’s a reason why he was the perfect detective. Haydn was also — you know, people who’d heard about him but hadn’t met him, when they did eventually meet him, were surprised that he was such an insignificant fellow. There’s a story about this, about an Italian, I think it was an Italian, priest who had come to Vienna. He saw Haydn and he said, “Oh, no, that can’t be Haydn! Haydn must be a big, strapping, handsome fellow, and this is just an insignificant little man. How can that be Haydn?” And so, you know, there’s a lot of potential there for a good detective, someone to go incognito as it were. So Haydn was pretty easy to write. Some of the other characters — Maria Anna and Johann, Michael, Rahier, too — were a little more difficult because there’s not very much about them. Haydn was important to people who have devoted themselves to his study, there’s quite a bit about him, but there’s not as much about his wife or about his younger brothers. And one is always hesitant, I think, in such cases just to make stuff up. But as a novelist you have to. Of course history, to a certain extent, is also conjecture. It’s your best guess, given the facts, your best guess. There are some things that you can’t know. A reader asked me about wigs and shaved heads. And the fact of the matter is, as you go into it, you can’t know. There’s no information really, and you’re just making an educated guess. LB: You use your blog to go into that, some of the bits and pieces of history that come alive for you. NT: Yes, I enjoy doing that. So much that I research and so much I found out, it’s hard to put it all into a novel. You can’t. Not all the details go in. At that point you’d have a history book and not a work of fiction. LB: You’ve used your research to plan out the next several novels in the series. NT: Yes. So the second novel is done, essentially done. I’m editing it and it’s like wading through molasses as I tell my husband, because it’s going so slow. The plots of the third and the fourth are worked out. And then, I haven’t thought about what I’ll do after that. I do want to keep on writing the Haydn series, but then I also have other ideas floating around so maybe after the fourth novel I’ll change things up a bit and focus on something else and then come back to Haydn. But, yes, the first four novels are worked out. LB: You yourself are also a composer. NT: Yes, that’s right. I’m an amateur composer, self-taught basically. And it all started in a strange kind of way. Because I was writing about a composer, I decided that I needed to know a little bit more about what it felt like to compose. I know what it feels like to write, and so writing about another writer would have been easy enough. You know what you go through. But writing about a composer was difficult without having any experience of my own. So I got a book from the library, it was one of those odd books, Composition For Dummies or An Idiot’s Guide To Composition or something like that. Then just for the heck of it I started doing the exercises and I enjoyed them so I kept at it. And I realized that I composed the way Haydn does, at least the way we’re told that he composed. He would sit down at the piano and he would improvise and work around with motifs and then he’d write down the ones that he thought had potential. And he’d develop a little sketch. So in the morning this is what he would do, he’d develop a sketch of the work, and then later in the afternoon he’d come and write it all out into a fair copy. I’m glad we know that about him because it gives you a start. If you want to compose, then that’s how you do it. At least with the first four novels, you could say I’m focusing on composers. In the first novel, you’re introduced to Haydn. The second one is about Monteverdi and the lost operas, so you’re introduced to another composer. In the third one, Haydn meets his mentor — he never did get to meet C.P.E. Bach, this is Johann Sebastian Bach’s son. So we learn a little bit about Bach. And then in the fourth novel he’s helping the Mozart family, so we learn a little bit about them. LB: So why a cozy? NT: You know, when I wrote the first draft, the first draft just had Haydn. Rosalie was a character in the first draft, but she didn’t have her own point of view. But she was such a strong character that when I started revising the novel and I was writing the second draft, I just had to give her her own point of view. And that’s the cozy aspect of it. And I enjoyed writing that aspect of it. It was nice to write about Haydn, but at the same time it’s also nice to have a female perspective, to be able to do that. In some way she’s easier to write, not just because she’s an imaginary character and I can imagine her in any way that I want to, but also because it’s easier as a woman to write about another woman. Sometimes with Haydn and Johann, I would have to turn to my husband and ask, “Is this something a man would do? Would this be appropriate? Is this something that a heterosexual man would do?” It’s just easier for me, and a little more natural for me to get into Rosalie’s, into her mind and to know what she would do or how she would feel. LB: In the same vein, you’ve been compared to Emily Brightwell. NT: Yes! And I’m so thrilled that she liked my novel because she’s been a huge influence on me. In terms of plot, I think she really does plot very well. She’s one of the few writers, perhaps the only one, who can really be compared Agatha Christie. She does something that Christie did really well. If you read the Miss Marple mysteries or even the Poirot mysteries, there’s a lot of talking to different people, but she somehow manages to make it interesting. It doesn’t seem like they’re getting any information and yet there’s something there. She constantly has you guessing, is it this person or is it that person? You’re constantly thinking about it. You’re actually involved in the mystery, thinking about the different suspects, trying to figure out as you’re reading who it is. I try to do that in my novels as well. LB: In addition to writing novels, you also write short stories. NT: Yes. I enjoy doing that. I never thought I’d write mystery short stories just because, well, a mystery plot can be very complex. Once you set up the mystery and then unwrapping it, that takes time and you really need space of a novel. So I think to write a good mystery — and that’s not to say that you can’t write good mystery short stories. I was determined to learn how to do that. I used to write short stories before I started writing novels, but they weren’t mystery short stories. That was a challenge. And I took a course through the Guppies chapter of Sisters in Crime. One of the tips the instructor gave us that was really helpful as far as writing mystery short stories is concerned was that it’s best to start with a kernel of an idea and then just to start writing. Don’t spend too much time plotting. And I find that really helpful to do because once I start plotting, things get complicated and complex, and it’s an idea for a novel rather than an idea for short story. Once I did write my short stories, I never thought I’d write an historical short story or even a Haydn short story, because I said, well, there’s just so much research involved, I’d rather write a novel. But I’ve immersed myself in his life enough that I can write a short story. There’s one coming out in July in an anthology of eclipse-based stories called Day of the Dark. The story is called “The Baker’s Boy”. It’s a young Haydn story. And then there’s another one that I’ve written for my subscribers, it’s just for them, and it’s called “A Whiff of Murder.” That’s set in Eisenstadt. Haydn is an older man. You meet the same characters that you do in A Minor Deception. LB: So if people want to keep up with you online or become one of your subscribers, where can they find you? LB: I will link to both of those in the show notes. LB: You also have a column, Agent Insight, where you’re helping other writers on the path to publication. Give any advice you give them? NT: I suppose if it had to boil down to advice, I say to anyone who’s doing this, if you have a dream, just keep at it. Don’t let anyone tell you that you can’t do it or tell you that it won’t work. If you believe in yourself, just keep going and be open to different options, is what I would say. LB: I just, I loved, in your book — I don’t know what it is, whether it’s the music coming through or something — but there’s a sense of, even though it’s a murder mystery, there’s a sense of playfulness and joy in your work. I just want to ask you, what did you find the most joyous about writing this novel? NT: I think, when you write about something that you’re really passionate about, something that you enjoy, that enthusiasm comes through. I think one of the most fun things about writing a novel is that — and I think this is important for any writer to remember — is that fiction transcends reality. And so if you’re constantly worried about things conforming to reality, you’re not going to have a good novel I don’t think. You not going to have a fun novel. I’m not talking about being unrealistic, there obviously has to be some sort of verisimilitude. If you’re writing a contemporary cozy, you can’t have people flying on Persian carpets, I’m not talking about that kind of thing. But human nature transcends rules and boundaries, and fiction transcends, has to transcend, reality. I’ll give you an example, maybe that will help clarify things. The second novel, in Aria to Death, we meet also Haydn’s first love, Therese, his wife’s sister. He was in love with her but she was promised to the convent, to Jesus, and so her parents suggested that he marry their older daughter, Maria Anna. And it wasn’t exactly a match made in heaven. So we meet Therese, she’s come out of the convent, there’s a little mystery at the convent that she needs to investigate. But there’s a part in the novel where she and Maria Anna exchange places. They need Therese out of the convent and the only way to do this is to send Maria Anna temporarily in. They look enough like each other for it to work. Now, that probably never happened. That’s something I’ve completely made up. But the thing is, sometimes you have to do stuff like that. Sometimes you just have to think about fiction transcending reality and about people breaking rules and laws — which they all did, and they still do. Think about the number of people who run red lights today, or think about the number of people who make that right turn when there’s a pedestrian light on and you see a mother with a baby trying to cross. So people break rules. People do things that they’re not supposed to do, and it’s important to remember that. And that’s how you get that kind of playful quality. You need to allow yourself to do that. And that, that part, that’s what makes writing fun. NT: Well, I’m working on Aria to Death, that’s the next Haydn novel. I’m editing it, it’s done, the story is complete, the plot is complete, so this is the editing process. At the same time, I’m researching the third novel, which takes place in Prussia. It’s called Prussian Counterpoint. We meet Frederick of Prussia, and then there’s C.P.E. Bach, whom we’ll meet. LB: Fantastic. Thank you so much for joining me today.